I’m not a reviewer. Don’t really know how to review. I’m lazy that way. For me to write a review, the story has to be good. That means that the material should be a four or even five stars. Three stars is okay, but I won’t write a review for that, and anything below three I won’t bother, unless the book is unforgivably that bad and should be torched. Haven’t come across one of those… yet. So I’m a horror fan and I’m a zombie fan. I really enjoy the apocalyptic possibilities of a world infected with some whacked out contagion that turns granny and her bingo buddies into a mass of munchers hungry for still quivering flesh. There are quite a few stories out there, in film and book, and it’s hard to find something that’s been done well. It doesn’t have to be 100% original for me, just done well. Quality will draw attention to itself moreso than quantity and will trump every time. So for you, if you are thinking about picking up this book, I have good news, and then better news. Knight has written a quality book. 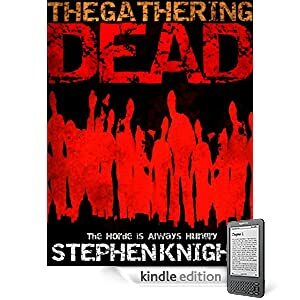 How good is the “The Gathering Dead?” It’s damn good. It’s good enough for me to overlook the typos and nitpicks found, and just be swept up in the story. It’s good enough that I stopped reading while halfway through the book, just to start writing this while some of the action sequences are still playing out in my mind… and I swear you’ll be sizing up stairwells and congested avenues with a different eye next time you’re in one (I know I will). Where I’ve thrown down unfinished paperbacks that cost four times as much, I ate this one up. And for only $2.99. I won’t go on about what I think makes a good zombie tale, and I’ve suffered through enough bad zombie tales to know that Knight has his game on in this. His life in the military comes through here, and his characters all know their business. There is a lot of tension, explosions, and a lot of shooting. There are casualties, as to be expected when a small force is up against a city of the dead. I don’t want to give anything more away. Read the description, and that’s what you can expect. I’m not sure exactly why some other posters didn’t like the story, but I just checked the ratings for this one, and I see four folks didn’t care for it, while the majority of readers that bought the book did. Can’t guarantee that you will, but I know I did enjoy it. Gobs n gobs. Oh yes, the better news I mentioned. Knight has other stories out there. Ones with vampires in ’em. For this reader, that’s potentially great news.